alaTest has collected and analyzed 1179 reviews of Sony HDR-CX405. The average rating for this product is 4.2/5, compared to an average rating of 4.1/5 for other Camcorders for all reviews. People really like the size and image quality. The price and portability also get good feedback. Some have doubts about the viewfinder and memory. There are some mixed reviews about the durability. We analyzed user and expert ratings, product age and more factors. 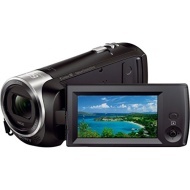 Compared to other Camcorders the Sony HDR-CX405 is awarded an overall alaScore™ of 91/100 = Excellent quality. Image stabilization is available to steady the effects of shaky hands or a rough environment. It has a manual lens cover. The Sony Handycam HDR-CX405 gives you the basic features you need from a camcorder and records in full 1080p high definition. Camera Good- Sony Micro card a Disaster!! I am using my Handycam HDR-CX405 since December 2017 when I got it. I love how it works. It just does a great job. It takes very good video shots, and also very good photos. I'm happy with my purchase. I got this camera for Christmas. Using very often mainly home videos. Very happy so far.